My Goodness, (not) My Guinness! I was in Dublin last week and, naturally, visited the Guinness Storehouse for a tour / taste of what is surely one of Ireland’s greatest achievements – Guinness Stout. I love Guinness – the way it tastes, the way it looks, the way it takes a few minutes of lovely effervesence to pour a proper pint, the way that thick foamy head forms and hangs around. 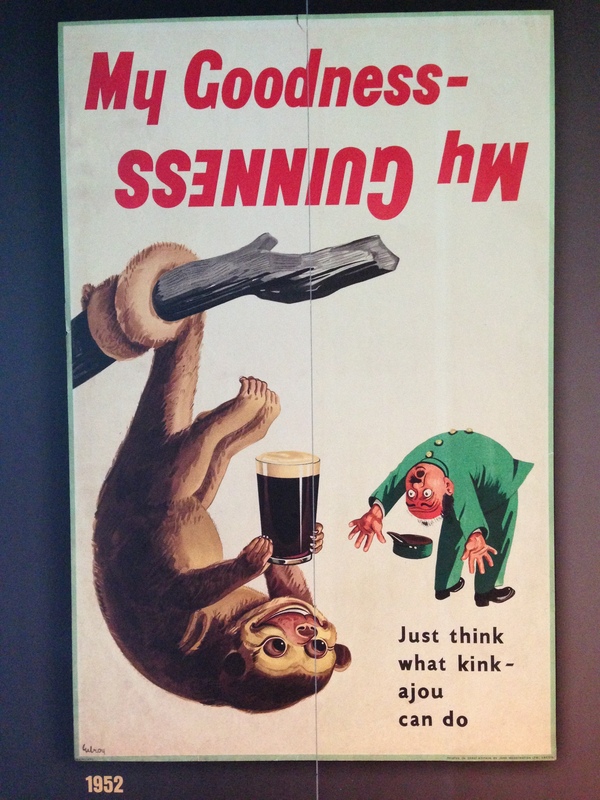 I also love Guinness for its admirable history of brilliant marketing – the characters, colors, slogans, and omnipresent wall murals that make it such an integral part of the Irish landscape. Guinness is a great beer, and it is a great brand. Which brings me to the vexing and confounding creation that I recently learned about – a beer called… Guinness American Blonde Lager. What are the first three things that pop into your mind when you hear the word Guinness? I’m guessing they’re something along the lines of Irish, dark, and stout. And isn’t it interesting that American, blonde, and lager seem fairly antithetical to those characteristics that we so closely associate with Guinness? In other words, WHAT THE HELL ARE THE PEOPLE AT GUINNESS THINKING!???? Actually, I have a pretty good idea of what they’re thinking. They’re thinking that Guinness is not doing as well in America as it should. That other beer brands are eating their lunch. That surely there’s a way to introduce Guinness to a new crowd of beer drinkers. Sure, the first two points there are right – Guinness is not doing that well in America, and other brands are indeed eating their lunch. But is introducing an American blonde lager a way to grow the Guinness brand? Better yet, is introducing a GUINNESS American blonde lager the way for Diageo, Guinness’ parent company, to grow their portfolio of beer brands in America? If you ask me, the answer is a resounding NO and NO. The folks at Guinness – and more rightly I should probably say the folks at Diageo – should properly recognize the great value that exists in the Guinness brand. The equities that it holds so strongly that offer opportunity… but also act as a form of tether. Sure, Guinness is bound by its history and heritage – but that tether should be considered not as a barrier to growth, but as a guideline for HOW to grow. How can Guinness take its heritage – its Irishness, blackness, stoutness – and use that as a springboard into the heart of the American beer drinking public? I can guarantee you that the answer is not by watering down everything that the brand stands for – by discarding Irish for American, black for blonde, stout for lager. Stick to your strengths, Guinness, and leave the light stuff to one of your sister brands. My goodness. That’s not MY Guinness. As was evident in the recent Atlanta SNOWPOCALYPSE(™), the good people of this city excel at coming together in times of need. And the story of the Giving Kitchen has been one of those amazing coming together stories that exemplifies our city’s spirit. Chef Ryan Hidinger is central to the story – one man’s battle with cancer morphing into a community rally for others in need. 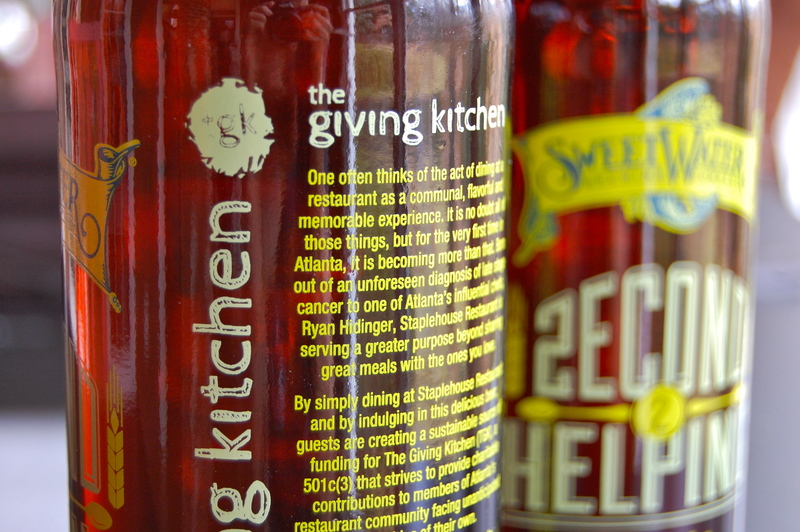 It was his battle that sparked the Giving Kitchen idea, and his remarkable enthusiasm and will that helped bring it to life. But it’s the embrace of the community around Hidinger that extends his legacy, and that embrace continues to be shown in an amazing multitude of ways. 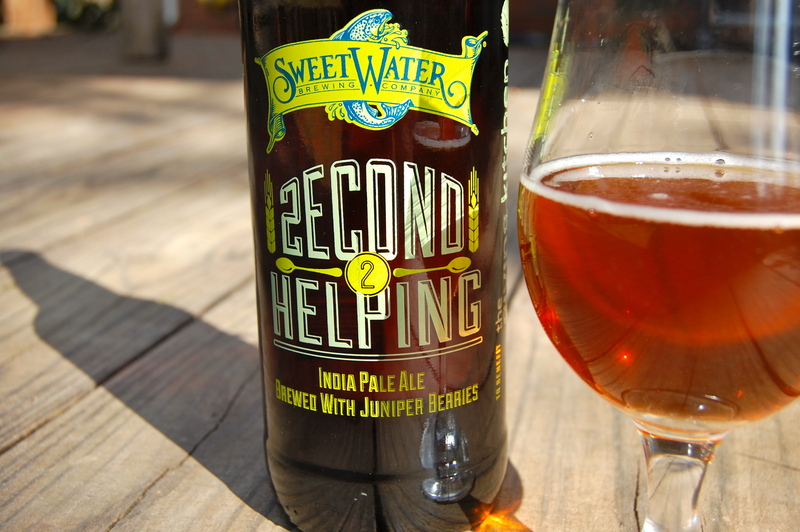 Like this Second Helping IPA from SweetWater Brewing Company. 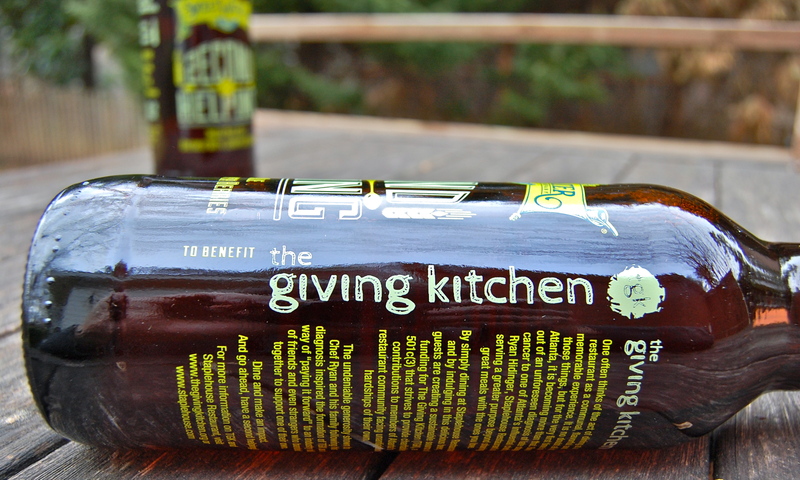 Simply put, Second Helping is a great beer with a great mission – to support the Giving Kitchen. The Giving Kitchen’s mission is to provide crisis grants to members of Atlanta’s restaurant community facing unanticipated hardship. The important thing here is that mission, that embrace. The secondary thing here is the taste. Have no doubt, though, that SweetWater and Hidinger teamed up to turn out something remarkable. I urge you to learn more about this cause, and to go try this beer. You’ll be glad you did on both counts. Second Helping is an Atlanta-only limited release (go get some now, seriously, it will be running out over the next couple weeks), served up in 22oz bottles or growlers in shops and bars all over town. I asked the folks at SweetWater about Second Helping’s success, and Francesca Zeifman there replied that Second Helping was one of their “fastest selling brews,” saying, “there was such passion put into this campaign from all parties involved, and the story behind the beer and its mission is so compelling. Nearly every drop was pre-sold before it hit the market.” See that? Community. 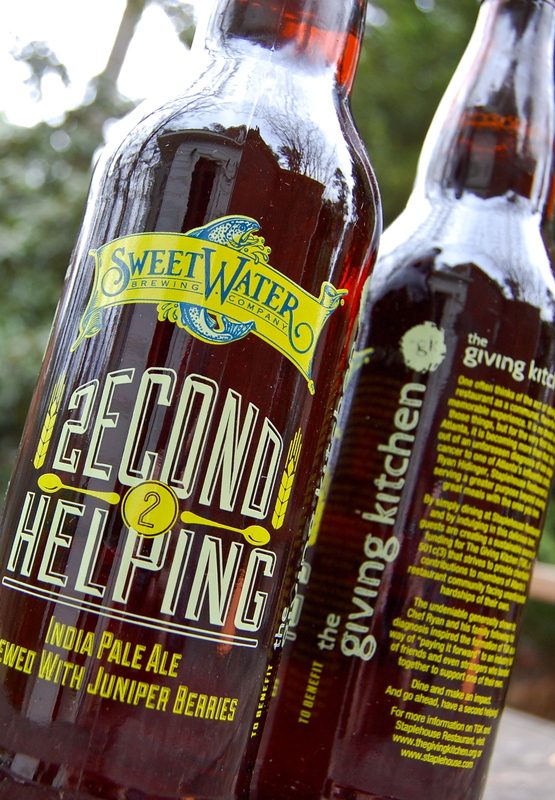 While no definite plans have been made for future Second Helping releases, SweetWater let me know that they do hope to continue working with the Giving Kitchen. Hopefully we’ll see a second (and third, and fourth) Second Helping. To learn more about the cause and the beer, visit thegivingkitchen.org, read this great intro from the AJC’s beer guru, Bob Townsend, or check out the video from Beer Street Journal featuring Nick Nock and Steve Farace from SweetWater. And here’s my review and tasting notes on the beer itself. For you beer geeks out there, Second Helping is made with a variety of specialty malts (2-row, Victory, Chocolate, Wheat), as well as five types of hops (Amarillo, Bravo, Centennial, Chinook, Simcoe). Juniper berries were added in the whirlpool, and also during dry hopping. And it’s those juniper berries that really make this one stand out. Second Helping pours a lovely rich copper, with hints of cherry wood red. The nose hits the expected pine and citrus notes, with a smooth and deep maltiness in the background. 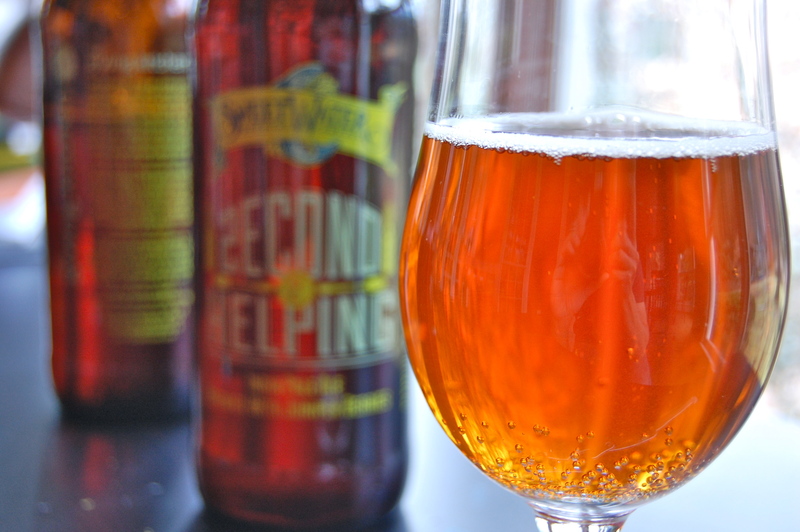 Second Helping has a pleasant and fairly lush mouthfeel. It’s a bit sharp at first, with that pine and citrus most prominent, also some more herbal botanical character, but then it mellows out quickly into caramel and a bit of chocolatey and hearty crusty bread. Then that crisp juniper gin character kicks in towards the finish, before melding into a hoppy IPA finish that goes on and on. That’s a lot of quick character evolving in a single sip, and it will have you coming back for more. I recently heard about a new, um, beer called Redd’s Apple Ale from Redd’s Brewing Company in Albany, Georgia. Now, I had never heard of Redd’s, and first thought it might be an interesting new microbrewery for the state of Georgia. But it turns out, Redd’s is a brand being launched by MillerCoors. OK, nothing wrong with that. They don’t especially want you to know that. But nothing wrong with that. It is brewed at the MillerCoors facility in Albany, so – for you Georgia beer fans – it does have that going for it. MillerCoors was nice enough to send me a few bottles to try, and right after I received them, I also started seeing Redd’s pop up in gas stations and grocery stores in Georgia and Alabama. Redd’s is also available in Arkansas, Florida, Louisiana, Mississippi, Missouri, Oklahoma, Texas, and Maine (how did Maine slip in to this list, does lobster pair exceptionally well with apple ale???). Just to be clear, this is an ale. Flavored with apple flavor. Colored with caramel coloring. It is not a hard cider (fermented apple juice). Now, you might ask, “why bother making an apple-flavored beer when you can brew a good cider from apples?” And I might answer, well, MillerCoors probably knows a lot more about turning grains into beer than they do about turning apples into cider. And that’s probably true, but it’s also true that they not too long ago snapped up Crispin Cider, who definitely knows a thing or three about turning apples into something liquid, delicious and mildly intoxicating (try their “artisanal reserves” if you can find them – in fact, maybe I’ll do some tasting notes on those soon). Redd’s Apple Ale is a lovely, moderately deep gold in color (in fact, it is downright caramel-y looking!). It pours with a nice fizz, but no head whatsoever, reinforcing that this is not going to be a typical ale. On the nose, Redd’s doesn’t give too much, with a bare hint of green apple over dusty malt. Poured into a glass, the carbonation is lively, and it hits the tongue with a pleasantly smooth, bubbly fizz. Overall, this comes across a lot like an easy-drinking version of a hard cider, not harsh or bitter at all. It’s very crisp and green appley, with an undertone of malt that comes on a bit stronger through the finish. Again, nothing particularly ale-like about this. Redd’s goes down easy, and is definitely appealing at first, but manages to quickly become boring. I was nodding my head in OK-this-is-not-bad appreciation with the first few sips, but then realized I was not at all eager for more – not for any negatives present, but rather for lack of any sort of ongoing interest. 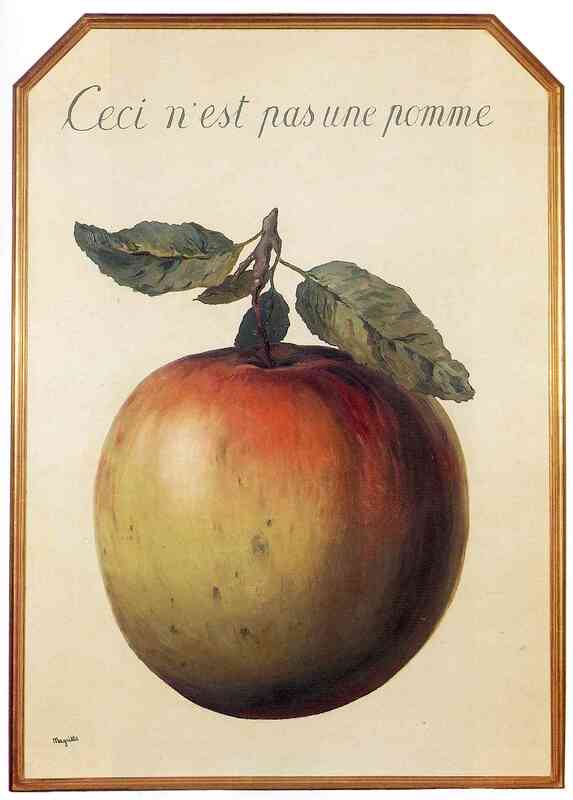 While the apple flavor is the dominant note here, it really is that – apple flavor – rather than the apple characteristics that can evolve into something more in a good hard cider. Verdict? Fair* – this is easy drinking, and offers a nice approximation of a hard cider – but why buy an apple ale when you can go for a real apple cider?